Wow! This is getting really exciting. The possibilities of what this might mean for your own walk with God are just beginning to appear. Before we talk about how to Obey the Gospel, let's do a quick review. We've labeled the last step in the Biblical Plan of Salvation, Obedience. The Bible in no uncertain terms and in a variety of ways, without contradiction, universally teaches that obedience to the Gospel precedes the forgiveness of sins or salvation. As we have seen, this is how we save ourselves, by responding in humble obedience to the Gospel of Christ. Remember, it's not works that save us, it's the blood of Christ, the power of the cross, and a humble submissive response to God's commands. 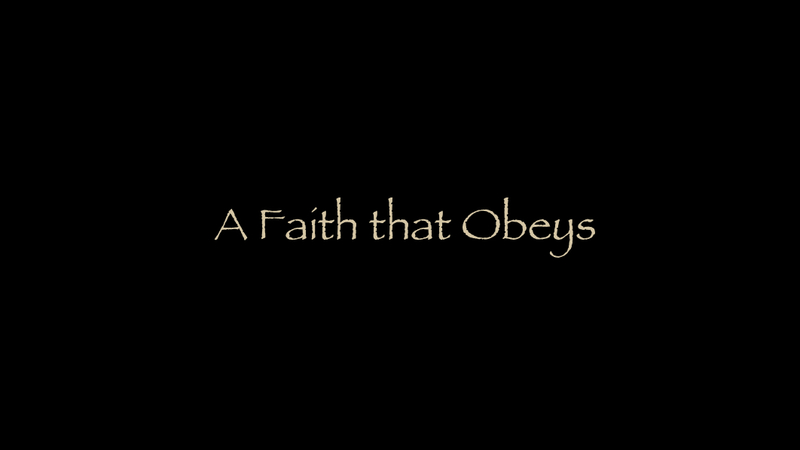 So, what does it mean to obey the gospel? We are about to spend a good deal of time dissecting a very important passage of scripture. This passage is loved and presented in nearly every church, but rarely understood or obeyed. Knowing what we know now, we'll be able to see the deeper more vital directives and obey them, not simply acknowledge this passage of scripture as one of the most important teachings of Jesus, but to take it seriously and actually obey it. You know this passage, it's called, "The Great Commission." Matthew 28:16-20 Then the eleven disciples went to Galilee, to the mountain where Jesus had told them to go. When they saw him, they worshiped him; but some doubted. Then Jesus came to them and said, All authority in heaven and on earth has been given to me Therefore go and make disciples of all nations, baptizing them in the name of the Father and of the Son and of the Holy Spirit, and teaching them to obey everything I have commanded you. And surely I am with you always, to the very end of the age. Have you have ever struggled with spiritual doubts? This passage should be super encouraging. Consider the fact that the eleven remaining disciples were standing right in front of the resurrected son of the living God... and the Bible, almost in a passing, mentions that some doubted. Is that not amazing! What would you be thinking if you were standing in front of the resurrected Christ? Doubt does not surprise God! It's the actions which follow doubt He seems to be concerned with. What will you do, despite your doubts. Will you run away or stay and obey. (You) Go Make Disciples. Baptize them. Teach them. The first command is direct and simple. It contains a subject, the implied "You," and a verb, "Go." This means, don't hang around here, get out, get away, leave this place and do what I am about to tell you. In this one word command, Jesus is telling the apostles they must be evangelistic. If they were not evangelistic would they have been obeying Jesus command? No. The second command, Make disciples. This is a huge one. Jesus did not tell the apostles to go make believers. He did not tell them to go make Christians. He used a very specific, very precise word, disciple. A disciple is a student or learner but the word means more than that. Today, we might use the word "apprentice" to better understand the depth of the relationship Jesus has with his followers. This type of student becomes like his teacher. He imitates the teacher to the best of his ability. Also implied here is that there is a process of making disciples and that process takes work. I have an entire study devoted to this one topic of making disciples, and it is quite challenging. Here are a couple of thoughts from that series as they apply to our discussion today. Making disciples does not mean getting someone to make an emotional decision or commitment to follow Jesus by raising their hand in a church service or saying a prayer to be saved. Truly making disciples requires a little more effort. First of all, it's one on one activity. Preaching can reach the masses and people can respond correctly but preaching in public... where the lost people are is pretty ineffective. We need a personal outreach to friends, neighbors and people we meet. When you find someone who is curious about Christ, you teach them the Gospel which includes their repentance... before they make a commitment to Christ. This means you should probably have, at least a little bit of a warm relationship with them. Try telling someone you are not really close to, they need to give up their job at the adult video store or break off that immoral relationship before they can become a disciple of Jesus and see where that gets you. Someone's gotta help them understand what sin is. Someone needs to love them enough to tell them the truth. Making a disciple means that sin is confronted, not ignored. This is done with gentleness and respect but in discipling churchs, sin is addressed scripturally before someone wants to become a Christian. The next command... Baptize them. Who is them? Well, the disciples which the Apostles have just made. The only person who is a candidate for water baptism is someone who has repented and is behaving like a disciple. The goal is to baptize people who are serious. Not everyone is. Simon the Sorcerer in Acts 8 comes to mind as a person who was baptized but apparently never repented. Like Simon, just because you get baptized does not make you a Christian or save your soul. As we have seen, there is far more to the plan of salvation than baptism. This part of the great commission certainly narrows down the qualifications for those who may be baptized. Finally, Jesus tells the Apostles to "teach them to obey everything I have commanded you." That sounds like a pretty tall order. Jesus taught them quite a bit in three years. Let's think about this command for a moment, just as it relates to the Great Commission and watch how this blossoms out and gets super personal. If the Apostles were to teach the disciples they made everything that Jesus commanded, would it not include what he has just finished teaching? And what was that? Go, make disciples, baptize them, teach them to obey everything. If you think this through, it is absolutely brilliant. The second generation of disciples would have been taught exactly the same thing Jesus told the apostles to do. So, what would the third generation be taught? Go. Make disciples. Baptize them. Teach them to obey everything they have just been taught, including the Great Commission! At the beginning of this series, I made a strong assertion that the Biblical Plan of Salvation should not have changed over two thousand years. It's my conviction, this pattern is exactly what we should still be teaching. Anyone who wants to become a Christian should be taught; it will be their responsibility to obey and to teach others the Great Commission. If you are in a church which does not teach and practice this pattern, there is something missing. These four commands have been handed down, generation after generation without alteration...it's never changed. Many churches laud the Great Commission but very few put it into real practice and hold their members accountable for fulfilling it. The Great Commission is seen as a goal... and ideal, but not a requirement. Every person who calls themselves a Christian must be going, making, baptizing and teaching. There is no other kind of Christian. When you find a church which actually holds it's members accountable to Biblical obedience, you'll find a growing, healthy church. Evangelism is not the Pastor's or Evangelist's job. Evangelism is the job of the church member. If we are not evangelistic, at some level, we are in disobedience to the scriptures. Now, here's where this begins to get really personal. If a disciple is made, it would be reasonable to conclude that I should know the person who made me a disciple? In other words, who taught me the truths of the scriptures, before I was saved? Remember, we are not talking about someone who gets us to come forward in a church service or pray a prayer. We are not talking about a person who guided you and counseled you after you believed in Jesus. We're talking about the person who sat down with you, opened the Bible, showed you the truth and called you to the Biblical standard of obedience before you were saved. So, let me ask you a question, "Who made you a disciple?" I can point back to a very specific time, place and person who showed me the truth by opening the scriptures. He helped me understand sin and its consequences. It took effort on his part. He showed me, from the Bible, what was involved in obeying Jesus. He called me to a Matthew 28:18 commitment and made sure I understood... I would be involved in the activities of the church. I could not be a spectator. You see, a disciple makes another disciple by explaining and helping them obey the Great Commission! This has never changed! So again, who made you a disciple? This is Jesus plan to evangelize the world and it is absolutely brilliant! A disciple makes a disciple. Can this be any clearer. You see, if we are not about the business of making disciples, are we truly disciples of Jesus? As a side note, think about who does the baptizing? After the first generation, it's the disciple who is making the disciple, it's not the preacher or the pastor or the deacons... it's you! Sounds like fun! Studying The Great Commission, brings up the issue of water baptism. There is a raging debate in the modern evangelical world which questions whether water baptism is necessary for salvation or the forgiveness of sins. Therefore baptism is not necessary for salvation. This is a really great topic. Let's do a quick review and then talk a little bit more about water baptism. We don't have time to go into that issue right now, but we will be visiting it in an upcoming lesson. Be watching for it. The Great Commission is a good litmus test to determine if we are actually doing the will of God. Jesus made it clear. We should be teaching the people we meet, exactly the same things he taught the Apostles who taught their followers who taught their followers. So that's why asking the question, "Who taught this to you or who made you a disciple?" is such a personal, penetrating question. Now, let's not loose sight of the central problem we are trying to deal with, the forgiveness of sins. After all, this is why Jesus came and why we have a Gospel. When we fail to obey the Gospel, which includes the Great Commission, can we really deal with sin and its consequences. Ah, sin and its consequences... these are the only things left if we are unwilling to respond appropriately to Christ's death on the cross. Without obedience, a person who makes a very real, very sincere commitment to Christ, does not receive the Holy Spirit as their helper. This leaves them in an extremely vulnerable and powerless state where much confusion abounds. Let me show you what happens when the cross of Christ is emptied of its power. Understand though, we are not saved because we are baptized, we are saved when we're baptized. This is how our faith and our obedience are made complete. We die to the old self and are raised as a son or daughter of God. This is when we are freed, by God, from sin and its consequences. Here's another good question. Who is currently discipling you? We never stop growing in Christ. Remember, a disciple is a student, a learner. A disciple is eager to grow and to change anything which is not in harmony with the character of Christ. To that end, we never stop being discipled by someone and we should always be helping someone weaker than us. Do you have a deep relationship with anyone... someone you talk to on a frequent, regular basis? I'm talking about the kind of friendship which is so strong, you are completely comfortable confessing... even your deepest sins? James 5:16 - Therefore confess your sins to each other and pray for each other so that you may be healed. The prayer of a righteous man is powerful and effective. Confession is bringing to light something that was previously unknown or undisclosed. A lot of folks think confession is telling God their sins. Sorry, God already knows. You are not disclosing anything new to Him. No, in order to obey James, true biblical confession is actually to another human being. Talk about dealing with our pride! This requires a ton of humility, trust and faith! Folks, this is why we need, deep ongoing relationships with a friend who can help us in our spiritual walk. Sometimes they are called disciplining partners or prayer partners, the name does not matter. The point is, if you want to be spiritually strong and stay faithful to the Lord, you'd better let a loving, spiritually strong disciple share your burdens and cheer you on... and you should be doing the same for them and others weaker than yourself! After we are saved, the prescription James presents is the only way we can continue to deal with the daily struggles and sins which Satan constantly throws our way. This is another major reason peple do not do well spiritually. They are not vulnerable or open about their lives. This is how we continue to deal with sin and it's consequences.